Perhaps you heard about it in the news, read a tweet on Twitter, or saw a photo on Instagram. There’s no denying the concept of “zero waste” is having a movement. Currently, San Francisco has a zero waste goal set for 2030, a huge undertaking. 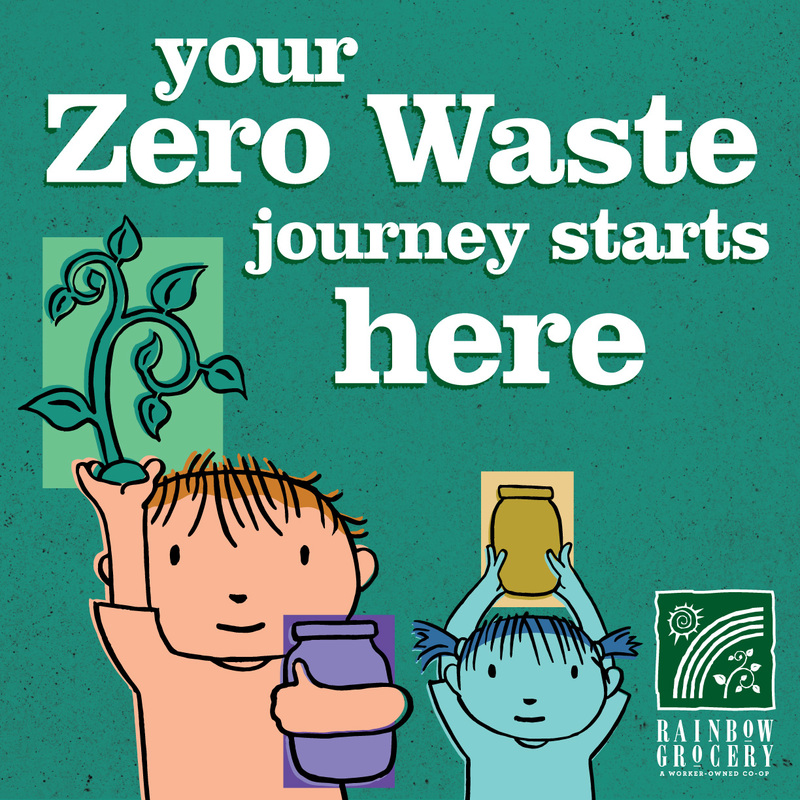 In supporting this effort, Rainbow Grocery has designated April as Zero Waste Month to spread awareness about waste reduction in our community. Below is a quick break down of what it means to “achieve” zero waste, as well as some resources to help those on their way towards waste reduction. What is Zero Waste, though? How is this different than recycling? Recycling alone is not enough; some even consider it as the last resort if the product cannot be reused. Plus, given the recent shifts in the global recycling market, a lot of what we were diverting to recycling streams might just be dumped in a landfill anyway. Luckily San Francisco has state-of-the art technology to help mitigate the impact of this problem. Even still, it’s important to prioritize reducing waste as a whole as well as improving our recycling habits. How can Rainbow help me in my Zero Waste journey? Rainbow believes a good place to start cutting waste is with one’s shopping and eating habits. We offer a tremendous amount of bulk goods–from herbs and spices to laundry soaps and essential oils–as well as reusable jars and bags for all your shopping needs. Our Bath & Body department provides a wide range of bulk items such as bath salts and hair dyes, shampoos and conditioners, and ingredients for many DIY body products. Our produce section is a great place to start nurturing one’s inner chef, cutting out the grab-and-go/take-out meals that are often packaged in single-use plastic. Recycle-Where, a resource for when you’re stumped about how to dispose of stuff. Recology’s Better at the Bin another helpful resource to help with how to better recycle and compost at home and work.